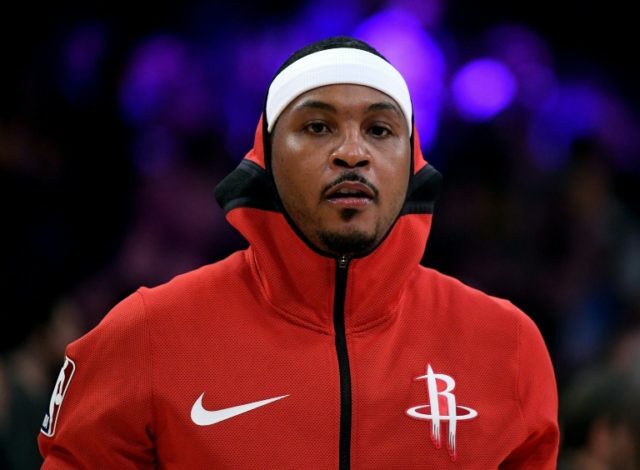 Los Angeles (AFP) – The Houston Rockets have agreed to offload Carmelo Anthony to the Chicago Bulls in order to ease the franchise’s luxury tax bill, reports said Tuesday. The Chicago Tribune reported that the Bulls would receive $1 million in cash for Anthony, who fills an open roster spot with the franchise. The paper reported that Anthony will be waived by the Bulls before the February 7 trade deadline and is not expected to suit up for his new team. The Rockets confirmed in November that Anthony was no longer in their plans after he played just 10 games for the Western Conference side. “Carmelo had a tremendous approach during his time with the Rockets and accepted every role head coach Mike D’Antoni gave him,” general manager Daryl Morey said in a statement at the time. Anthony, selected third overall by Denver in the 2003 NBA Draft, He moved to the New York Knicks in 2011 and, after a spell with Oklahoma City, signed with Houston as a free agent last year with the aim of contending for a title. The 34-year-old is one of 11 players in NBA history with career averages of at least 24.0 points, 6.0 rebounds, and 3.0 assists and is a three-time Olympic gold medalist. His departure from the Rockets edges him closer to a possible landing spot at the Los Angeles Lakers, who have been repeatedly linked to a move for the veteran.